More leads, higher closing prices and an engaging experience that keeps users on your website for longer – what’s not to love about new marketing capabilities and portal-friendly 3D virtual walkthroughs? Here are 11 reasons why you should embrace this technology. Stand out from your competitors – Despite adopting modern marketing methods, sellers still go down the traditional route of inviting three estate agents to value their home. If you’re using 3D virtual walkthroughs and your rivals aren’t, you have created an instant differentiator. Boost leads and inquiries - Properties listed with virtual walkthroughs can achieve as many as four times the number of inquiries and generate 49% more leads than conventional listings. Portals are now primed - Zoopla, Rightmove and OnTheMarket (not to mention Google Street View) all now incorporate functionality to allow 3D virtual walkthroughs – not just on desktop sites but on mobile and versions too. The portals actively sought virtual walkthrough partnerships with companies such as Matterport, and have acknowledged their value as a listings tool. Achieve a higher sale price - Research indicates that virtual walkthroughs can help achieve higher sales prices – with clients reporting agreed sales as much as 50% above the asking price. Sell homes quicker - Properties sell five times faster with virtual walkthroughs than traditional imagery so if you’re worried about a home languishing on the market, order a virtual walkthrough. Engage more people – It’s a real buzzword but engagement is important in property. 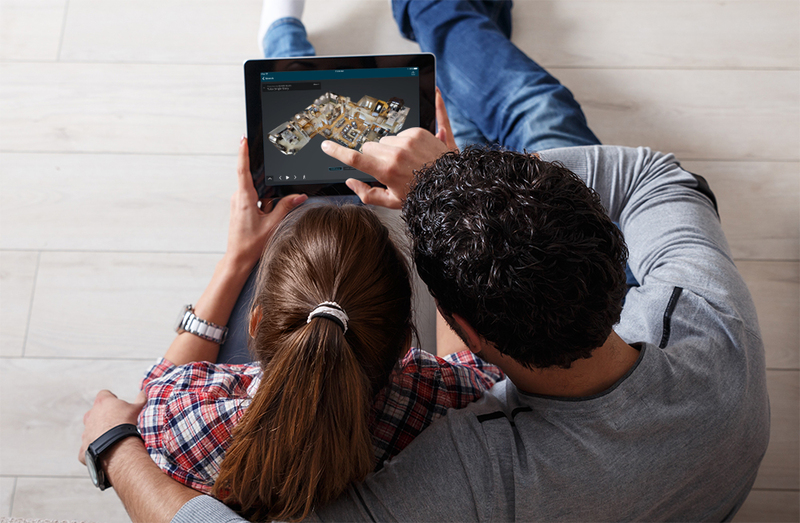 If a buyer can interact with a listing and even control their viewing experience, they’re more likely to connect with a property. Another plus point is virtual walkthroughs keep people on web pages for longer, which Google ranks well. Allow people to fall in love - When viewing a property online, buyers decide within just eight minutes if they will arrange a viewing. It is much easier for the buyer to fall in love with a property if they can see it in detail and imagine themselves living there. Offer 24/7 viewings – A virtual walkthrough gives you the ability to guide a potential buyer around a property at any time. It’s great if you work remotely or want to appease a client who requests a property tour outside of your normal business hours. Reach movers far and wide – Decision makers can’t always visit a property and some are in the market to make quick offers. A virtual walkthrough is a great tool when you’re dealing with international buyers, families purchasing for students, relocators and property investors. Give people more reasons to visit your branch – Stop with the racks of brochures and create an immersive virtual reality area within your branch. Potential buyers and tenants can come to your office and enjoy a tour of a property that leaves a lasting impression. Save time – How many times have you come back from a viewing and thought ‘what a waste of time’? Virtual walkthroughs are a great pre-qualification tool that allows you to weed out the tyre kickers from the genuine movers. You can spend more time in the office and cherry pick the occasions when it’s really worth conducting a viewing in person. The day has arrived when home movers expect more out of their home search and access to a virtual walkthrough is becoming the standard. With multiple benefits for agents themselves, it’s time to upgrade and differentiate yourself with a style of property listing that expands beyond simply static photos. Why not experience the 3D walkthrough difference for yourself? Contact Matterport and we will show you some examples.